Nissan's luxury arm needs to make more money before it can justify the costs of joint development with Mercedes. Reuters is reporting that the Renault-Nissan partnership with Mercedes-Benz has just suffered a big setback, with the former scrapping plans to jointly develop luxury cars. 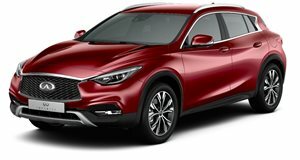 The news came from unnamed sources, who said that Infiniti would not be using MFA2, an updated version of a Daimler platform that both companies had funded. "It wasn't possible to close a deal on the basis of MFA2. The targets set by Infiniti were too difficult to achieve,” one of the anonymous sources told Reuters. The decision by Infiniti will have far-reaching consequences. For starters, the two companies are set to begin production at a $1 billion plant located in Aguascalientes, Mexico. The single assembly line will build both Mercedes and Infinitis, although the output (and cost) will be shifted towards the German automaker now. The Mexican plant will still produce Infinitis, albeit those based on existing architecture like the upcoming next-generation QX50. The main cause behind this rumored move is simple: Infiniti won’t make enough money to justify building re-badged Mercedes. "One of the lessons learned is that if you have the costs of a luxury vehicle but not the pricing, it's hard to be profitable," a source close to the situation told Reuters. The automaker set a sales record in 2016, moving over 230,000 cars worldwide. The problem is that growth outside of the US has been slow. Of those 230,000 cars sold worldwide 138,000 came from the United States. Posting positive growth worldwide is good, but the rate of said growth appears to be too slow to justify developing new models using Mercedes architecture. The partnership between the Japanese and Germans is bearing fruit in other areas, including engine development, but the big goal is massive cost-cutting through joint development of cars. The folks over in Stuttgart can't be too excited about this news, this despite 2016 being an incredible year for sales. Mercedes sold more cars in the US (380,752) than Infiniti did globally so the Germans aren't exactly hurting for cash. Still, they have to be pissed if this news turns out to be true.